A parliamentary report of 1777 recorded a local workhouse in operation in Tweedmouth for up to 36 inmates. County Durham: Ancroft (2), Cornhill, Duddo, Felkington, Grindon, Holy Island, Horncliffe, Kyloe, Loan End, Longridge, Norham Mains, Shoreswood, Thornton, Twizell, Tweedmouth (5). The population falling within the union at the 1831 census had been 20,782 with parishes and townships ranging in size from Longridge (population 105) to Berwick itself (8,920). The average annual poor-rate expenditure for the period 1834-36 had been £8,442 or 8s.1d per head of the population. 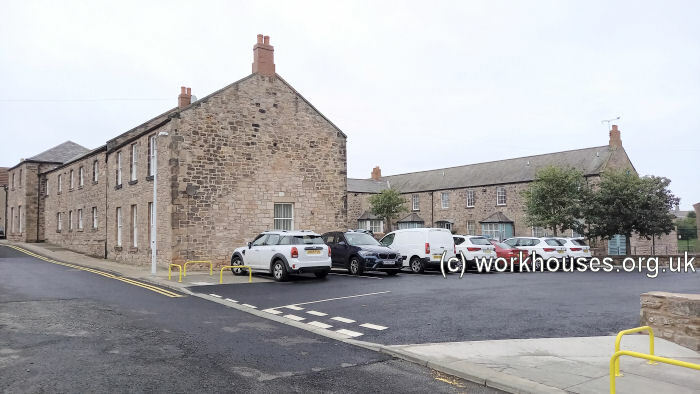 The new union took over an existing workhouse building in Berwick dating from the early nineteenth century which had originally been a sack manufactory. The building had a main H-shaped block with a separate block at the west housing the boys' school room, hospital and vagrants' wards. The entrance to the workhouse was via a narrow lane along the south of the site from Featherbed Lane (now Brucegate) to the east. The site layout is shown on the 1852 map below. Between 1852 and 1898, the dining room was demolished, and wings added at the east of the school/hospital block. The workhouse layout in 1898 is shown below. The north-west wing of the main block housed boys' accommodation and the Guardians' board-room. Berwick-upon-Tweed boys' wing and Guardians board-room from the north-west, 2001. The south-west wing housed adult males. The girls' yard and quarters were to its east. Berwick-upon-Tweed main building from the south-west, 2001. The central wing of the main building contained the Master's house and kitchens. Berwick-upon-Tweed main building from the south, 2001. The women's yard lay at the north of the main building. Berwick-upon-Tweed main building from the north-east, 2001. The workhouse had separate boys' and girls' schools and admitted the children out paupers on out-relief. In 1866, there were seven pupils from the workhouse and around eighty from outside. 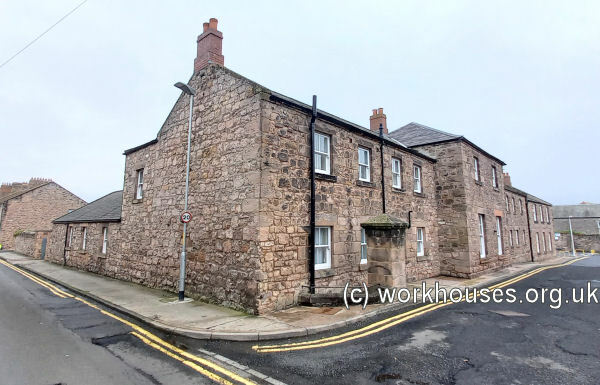 The former workhouse later became a geriatric hospital linked with the Berwick Infirmary which stands just to its south-east. The hospital block was demolished in around 1990 to make way for a new maternity unit. In 2001, the surviving buildings were redeveloped for use as housing. 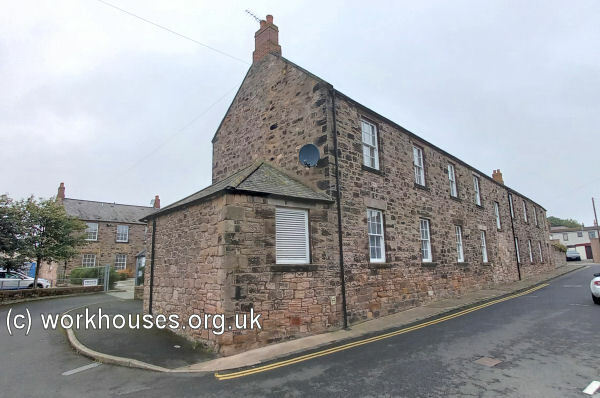 Berwick-upon-Tweed Record Office, Council Offices, Wallace Green, Berwick-upon-Tweed TD15 1ED. Holdings include: Guardians' minute books (1840-1919); Births and deaths registers (1837-1914); Children's Home admissions order book (1912-21); etc.